The church on the main square of Pécs is its architectonic symbol. After the Ottoman occupation in 1543, the gothic parish church was demolished and the “mosque of the victorious pasha Gasi Khassim” built in its place. It is the largest remaining Ottoman monument in Hungary. On October 12th 1686 after the Austrian troops under Louis Margrave of Baden had recaptured the city, the officers retreated into the mosque to sing the Te Deum. At the end of the 17th century, the mosque was given to the Jesuits, who altered the building after Catholic regulations into a Christian church. Since 1989, a German service is held there on Sundays; currently at 8.30 am. 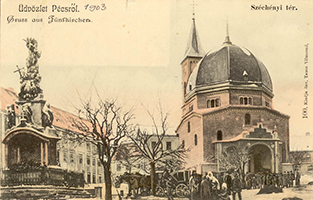 The central parish church with its trinity statue (1903).